Philadelphia police are investigating a series of residential burglaries in the city's Overbrook section. 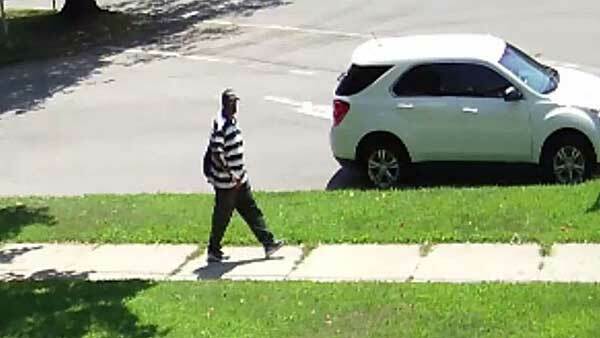 OVERBROOK (WPVI) -- Philadelphia police are searching for a man who they say is wanted in connection with at least 4 home burglaries in the city's Overbrook section. The burglaries happened between July 17 and August 25 during the hours of 12 p.m. and 2 p.m.
Two burglaries occurred on the 5400 block of Woodbine Avenue. A third was reported on the 2200 block of North 53rd Street. The most recent incident happened on the 5300 block of Woodbine Avenue. Surveillance cameras from one of the homes captured a man who is believed to be involved in all four burglaries. Police describe the suspect as a black male wearing a white shirt with dark stripes, dark colored pants and shoes, a baseball hat and backpack. If you recognize this suspect, call police at 215.686.TIPS (8477) or text a tip to PPD TIP (773847).